Finland's Amorphis are a band that only recently appeared on my radar screen, mainly due to the fact that until their fourth and newest full-length CD 'Tuonela,' Amorphis were pretty much pure death metal. Well, the transition into their current hybrid sound of wah-guitar psychedelia and pounding heavy metal wasn't quite *that* abrupt. For instance, the "My Kantele" EP that appeared in between 'Tuonela' and the previous transition album 'Elegy' included covers of both Hawkwind's "Levitation" and (Finnish compatriots) Kingston Wall's "And I Hear You Call." In general, you can peruse the online discography at www.amorphis.net with cover art scans of their eight releases (four CDs, four CD-EPs), and judge where the transition occurred simply by the change in the band's logo, from the menacing font of the early releases to the more 'benign' type and imagery displayed on more recent works. Of course, given Amorphis' pedigree, their fanbase is still deeply rooted in the 'extreme' metal community... I'm sorry I can't be more specific than that, but I suppose that from amongst something from 'black metal,' 'death metal', or 'doom'... one of these terms should be appropriate. (But which?) Anyway, Amorphis came to the states with two other European bands that they must know from touring in years past, whether or not they still belong together on the same bill or not. First up though was Pittsburgh's own Allan, a four-piece 'death metal' (I suppose) band with a fair amount of musicianship and writing talent, I must admit. Of course, the growly unintelligible 'death' vocals are something I can't advocate (to say the least), and because each of the first three acts used these (nearly) exclusively, I was left to focus on the music instead. Club Laga is not a large place, and sitting on a bench attached to the back wall of the club meant that I got to 'feel' the music as much as hear it. Translation: It was bloody loud! But in 35 minutes, Allan showed that they could hold their own with the Euros, and I was impressed with bassist Bobby Spell's playing. But my ears were hurting already.... and still three more to go! By process of elimination (the introduction was impossible to make out), Norway's Covenant was up next. Musically-speaking, this five-piece (with a keyboardist hidden behind an amplifier stack) was quite intriguing...an intense, gothic-flavored industrial-metal hybrid that, with a 'normal' vocalist, would have impressed me quite a lot. In a few passages, the lead 'death' vocals were merged with a female voice (that was either piped in via the keyboardist, or else there was one more person hidden in the back) or gothic 'chorale' voices that provided extra dark ambiance. The finale ("Spaceman" I think), a weird amalgam of similar metallic sounds and 'Ziggy Stardust'-like crooning left me puzzled, but intrigued. Moonspell, from Portugal, wasn't so interesting. Lots of hammering and rapid-fire double bass drumming, and the obligatory Satanic throat-clearing vocalizations. Their cover of Joy Division's "Love Will Tear Us Apart" reminded me of Type O Negative's rendering of Seals & Crofts' "Summer Breeze" in the category of 'surreal.' By the end, my ears had (almost) gotten used to the incredible pounding noise, but I was getting rather anxious for the comparatively 'melodic' (new) Amorphis to appear. Luckily, the schedule was tight, and Moonspell wrapped things up in about 45 minutes. As Amorphis is really at an important crossroads in their career, I'm sure it's been hard for them to reconcile their 'extreme' past with their current more mainstream-friendly sound. Hence, I was likely one of the very few in the decidely-blackclad, facemetal-sporting audience of ~150 who were thinking, "I hope they play a lot from the new album." I'm sure the handful of boisterous moshers (that nearly caused a fight during Moonspell's set) were certainly downtrodden upon the arrival of such works as the Scorps-style power ballad "Tuonela," anyway. (It's *far* better than that description suggests!) The unfortunate thing was that the soundmen on this night were primed on mixing the bands on the premise of "jackhammers before melody." So much of the nuances of Amorphis' new style, and in particular the wah-guitar of Tomi Kuivusaari or the melodic lead lines of Esa Holopainen's guitar were buried under the blitzkrieg of (newcomer) Niclas Etelavuori's bass and Pekka Kasari's drums. And Santeri Kallio's keyboard textures? Forget it... only audible during the rare quiet intros and bridge passages. Hence, the lone death metal throwback tune ("Greed") from 'Tuonela' was the show's highlight, where I forgave the double-bass thundering and Pasi Koskinen's rare bout of gutteral angst-spewing because of the awesome blistering rhythmic onslaught. By show's end, Amorphis had performed all of the first six tunes from 'Tuonela' and a pair of tracks each from 1994's 'Tales from the Thousand Lakes' and 1996's 'Elegy.' Throughout, Koskinen proved that he's capable of crossing over between the clean, melodic vocals of the new material as well as covering the tunes sung entirely in the 'old' death metal style (originally done by guitarist Koivusaari). In the end, I chose to catch Amorphis in Pittsburgh (rather than Cincinnati or Cleveland) because in most US cities, the three European groups are together supporting Armored Saint. 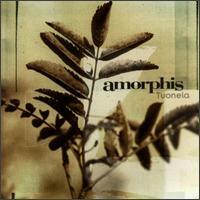 So I figured that I would get an extra 15-20 minutes of Amorphis here... and I was right. The band returned after the small but appreciative audience worked up enough of a chant and cranked out versions of both an oldie ("In the Beginning" from 'Tales...') and the newest single "Divinity." An encore that in a microcosmic sense was a reflection of the Amorphis history to date. Next time though, I wonder if Amorphis will still be catering to the same crowd or whether they might have been completely cast aside as 'sell-outs' by the true mosher-types. I'm one who thinks that rather than selling out, they've hit on a very imaginative psychedelic-metal sound that has yet to find its 'true' audience completely. Perhaps they should have even changed the band's name? After all, only two of the six are original members. Whatever the case... I think it might be in their best interest to find new touring partners soon... most importantly to get the soundmen to mix the sound right!